Congratulations to Jeff Lisandro, Winner of Event 16 ($124,959)! Jeff Lisandro, Champion of Event 16! Three days of seven-card stud play have produced a champion in Event 16. His name is Jeff Lisandro, and he's not a stranger to the champion's podium. 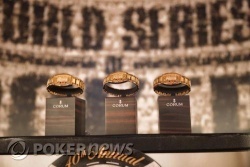 This is Lisandro's second WSOP bracelet, the first coming two years ago in the same game. It was the smoothest of sailing for Lisandro at today's final table. He squeezed extra bets when he was ahead and saved them when he was behind, the hallmark of an excellent fixed-limit player. He also ran incredibly well, frustrating several of his opponents into almost giving up at his apparent invincibility. When you have opponents feeling like they can't beat you, you're in a good spot. For besting a field of 359 players, Lisandro will pocket $124,959 in prize money in addition to the aforementioned gold bracelet. Congratulations Jeff! That concludes our coverage of this event, but there's still many more weeks of WSOP action here at the Rio Convention Center. 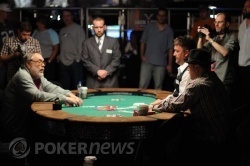 Keep your browser pointed at PokerNews.com for live coverage of each and every event! Jeff Lisandro brought it in with the , Rod Pardey completed with the , Lisandro raised and Pardey called. Lisandro caught the on fourth street while Pardey received the . Pardey checked, Lisandro bet, Pardey raised all in and Lisandro called. Lisandro turned up in the hole as Pardey's face fell. When all the board cards were dealt, Lisandro ended up with for an ace-high flush to send Pardey to the rail as our runner-up. Jeff Lisandro is our champion, winning his second WSOP bracelet and $124,959! Well we won't quote any old Willie Nelson songs yet, because the "Pardey's" not over just yet, but the lights are getting dim. Jeff Lisandro bet every street until the river, where he checked. Pardey checked behind and mucked when Lisandro turned over in the hole for two pair, tens and sevens. Pardey now has less than 100,000 chips. Even the small pots matter now. Jeff Lisandro and Rod Pardey checked down fifth, sixth and seventh streets, with Lisandro's making a pair of queens to win the pot. 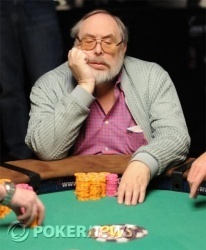 It wasn't a big one, but Pardey can't afford to lose many pots at all. 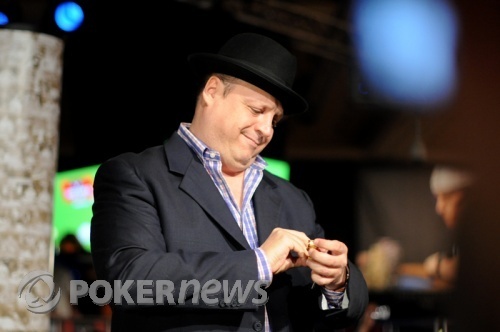 Slowly but surely, Jeff Lisandro is inching closer to the bracelet in this event. He check-called or called Rod Pardey down the whole way to seventh street, where he finally put in a bet of his own after Pardey checked. Pardey called to see bad news: Lisandro had three spades in the hole, , for a spade flush. Pardey is down to 275,000. Lisandro is sitting behind about 1.34 million. After dropping a couple of pots to Jeff Lisandro in the first few hands of heads-up play, Rod Pardey just reclaimed a few of his chips. Lisandro had the bring-in, Pardey completed and Lisandro called. Pardey led out on fourth street and Lisandro looked him up. Lisandro made an open pair of fours on fifth and led out, Pardey raised and Lisandro called. Lisandro check-called a bet on sixth and both players checked on seventh. Pardey showed for a pair of sevens and a busted straight draw. His hand was good, as Lisandro mucked and Pardey took down the pot. Both of our remaining players in this event have been in this spot before... and won. 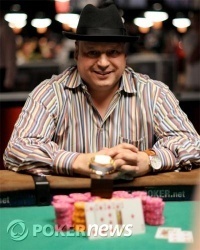 Rod Pardey has two seven-card stud bracelets to his name, one in 1991 and 1994, while Lisandro won the $2,000 Seven-Card Stud event in 2007 capturing his first bracelet. Cards are in the air and heads-up play has commenced.